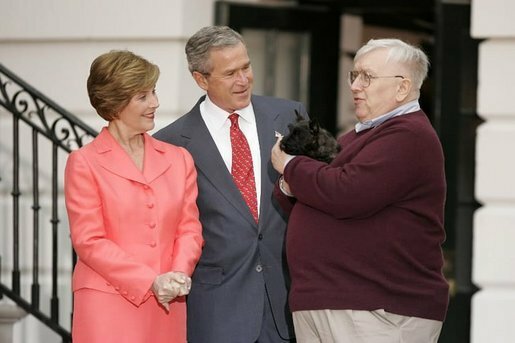 President Bush and Laura Bush receive Miss Beazley from breeder Bill Berry, Jan. 6, 2005. Miss Beazley started her first day at the White House with a press conference. 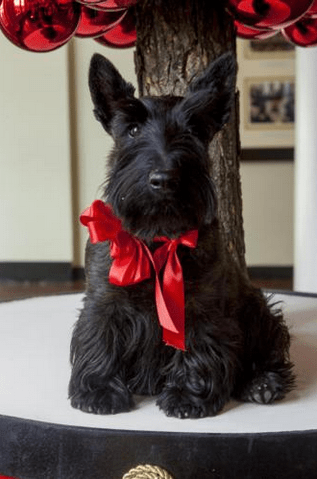 Miss Beazley, a lively Scottish terrier, came to live at the White House in January 2005 as a birthday gift from President George W. Bush to his wife, Laura. The First Lady named her 10-week-old puppy after a character from Oliver Butterworth’s 1956 children’s book, The Enormous Egg (affiliate link). That Christmas, Miss Beazley and Barney, the Bush’s first Scotty who had moved into the White House with the family in 2001, were featured in the White House video “A Very Beazley Christmas” in honor of her first holiday in the White House. The two Scotties — who were indeed biologically related — became devoted pals, and dog fans everywhere enjoyed watching videos of them playing ball on the White House lawn. What Happened to Miss Beazley? Miss Beazley was born October 28, 2004. After the Bushes left the White House, Miss Beazley lived in Dallas, Texas with them. According to Mrs. Bush, Miss Beazley was distraught over her friend Barney’s death in early 2013. “Miss Beazley really seems to be sad… she seems a little lost looking for Barney,” she told reporters. On Saturday, May 17, 2014, Miss Beazley died after a battle with cancer. She was nearly 10 years old, and her death leaves Bo and Sunny Obama as the only living presidential pets. Barney gives a little playful chase to Miss Beazley on the South Lawn, Jan. 6, 2005. After a big first day, Miss Beazley comes to say hello to Mrs. Bush. This photo, from the National Archives, is dated Nov. 29, 2006. This leaves us in a somewhat rare situation where the only White House pets now alive are those currently living there. That hasn’t been the case since former President George H.W. Bush’s dog Millie died in 1997, leaving then-President Clinton’s Buddy and Socks the cat as the only surviving presidential pets. I was sorry to hear about Miss Beazley’s passing. I know the President and Mrs. Bush loved her as part of their family.